As a middle schooler, I was fortunate to have one English teacher throughout those tumultuous years who encouraged my interest in poetry. Mr. Pace knew I was a rare breed: a perceptive and sensitive farm boy interested in writing and things literary, though not the greatest scholar. My profile, he felt, matched up with a certain northeastern poet whose canonized tomes of work combined the rhythmic labors of agriculture with the delicate intricacies of poetic diction. 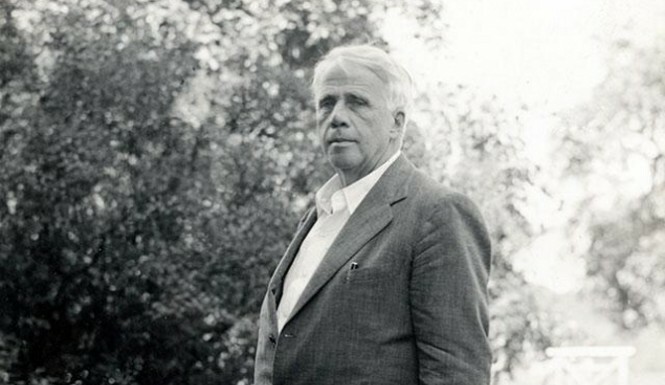 Hence, my introduction to the works of Robert Frost began. I would sit atop our barn roof overlooking our orange grove, and read everything from “Out, Out –” to “Stopping by Woods on a Snowy Evening.” I’d never seen snow. This was central Florida, after all. It didn’t matter — Frost brought it to life with his vintage imagery and steady, clopping-horse meter. And then, of course, there were the apple orchard pieces. From “After Apple-Picking” to “Mending Wall,” I knew well the lifestyle he described, even though our farm and its accompanying ladders and fences were more than a thousand miles away from New England. Like Frost, I knew the press of a rung into flesh and the whisper and sway of fruit trees. Here was a man who “got” me, I felt, even though he was long since dead. My love for Frost’s work continued into high school and college, and I wrote bad pastiches of his work, thinking I was being totally original all the while. After all, my “citrus farm” poems were completely disparate from anything New Englandish. Yeah, right. As I look over my older pieces, I hear familiar iambs and rustic rhymes that mark a younger poet’s perception of excellent verse. How brilliant I believed my rhyme schemes and wordplay to be! If only the rest of the world could see this marvelous talent, I thought, refusing to admit that every syllable was a tribute to America’s godfather of poetry — Frost. Even my first book, Growing Moon, Growing Soil, contains blatant influence from “Frosty Bob.” As I matured, my reading tastes expanded to include contemporary voices and a vast array of styles. But as a writer, I kept coming back to those paradoxical poems — so seemingly simple, yet profound. Frost’s work occupied a space on my mental bookshelf alongside Bible verses and the Scout Oath and Law — it was ingrained among the ridges and folds of my brain’s landscape as surely as cut weeds turned under by a grove disc. Today, my work is influenced differently — I no longer strive to “sound like” this poet or that one, but my poetry (I like to think) has come into its own. One of the greatest compliments of my more recent work came from poet Erica Dawson: “John is accomplished. He knows his voice. He knows his subject matter. He knows his style.” Those words, like Mr. Pace’s initial encouragement, gave me not only assurance, but a goal. If my work is to reach the level of greats like Frost, it must be identifiable as uniquely mine. The thumbprints of many poets may be found within my writing, no doubt, but when the final draft is finished, my hope is that it surges with a different pulse; one as recognizable as Frost’s, but unique — oranges to everyone else’s apples.